In June 2007, the FBI informed the NBA that one of its referees, Tim Donaghy, was the subject of a probe into illegal gambling. Within months, the public knew the broad outlines of a scheme involving Donaghy betting on games he officiated with a co-conspirator, longtime Donaghy acquaintance and professional gambler Jimmy “Baba” Battista. They were joined in the scandal by a mutual childhood friend, Tommy Martino. By November 2008, each man had pleaded guilty to charges relating to the conspiracy, and was in federal prison. The story was over. Or so it seemed to be. Researched with dozens of interviews, court documents, betting records, referee statistics, and unique access to witness statements and confidential law enforcement files, GAMING THE GAME looks inside the FBI’s investigation and beyond to provide the definitive account of the scandal. Jimmy Battista’s remarkable decades-long bookmaking and betting career is examined, including and especially his role as architect of the widely publicized scandal. Battista, who – unlike his co-conspirators – never spoke with federal authorities, reveals for the first time the intricate details of the scheme, most of which only he knows. Pro gambler Battista’s discovery of referee Donaghy’s bets on games he was officiating, and an examination of what pro gamblers, led by Battista, were doing with this information for years before Battista and Donaghy ever agreed to their own illicit deal. Details of Battista’s relationships with co-conspirators Donaghy and Martino dating back many years, including the extent of their involvement together in the betting world. 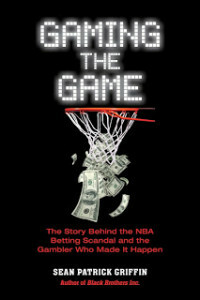 The unraveling of the NBA betting conspiracy, including the behind-the-scenes details of Battista’s indictment, arrest, and negotiations with federal authorities. first ever discussion of why pro gamblers wagered millions on games Donaghy officiated and bet, and the compelling evidence which supports their contentions that Donaghy influenced game outcomes when his bets were at stake. The trying – but ultimately and ironically fortuitous – mix of Philly mob extortion and local law enforcement heat that forced Battista’s move from Philadelphia’s suburbs to Las Vegas, without which his meteoric rise to the top of the betting world could never have occurred. Inside accounts detailing the highest levels of the Las Vegas-based international betting scene. A mind-boggling look into the big-time offshore sports betting infrastructure and its operations within the U.S., including the daily, secretive movement of millions of dollars. A fascinating discussion of the world’s tight-knit fraternity of heavy-hitting sports gamblers. The mechanics of wagering millions of dollars on a particular bet, which few people have ever understood – and even fewer could pull off (for a host of reasons beyond acquiring the funds).